I admit I have been a bit of a post squirrel, since my life in the real world has been pretty hectic the past month. I have moved my family of 5 from one continent to another. A daunting task. On our must do asap list has been things like: Buy car and insurances. Set up phone service, internet, cable, water, gas and electricity. Paint entire house, enroll 2 kids in school and take care of 3 year old happy camper while waiting for spot in preschool. Oh by the way, must apply for interesting job as well, while receiving and unpacking what seems like thousands, but is only hundreds of boxes. Use red roasted peppers in place of the marinated artichokes. Not only does it taste great, it looks beautiful too. Next up: My all time favorite baked bars: Cherry pistachio bars. You do not want to miss these bars. I am serious! 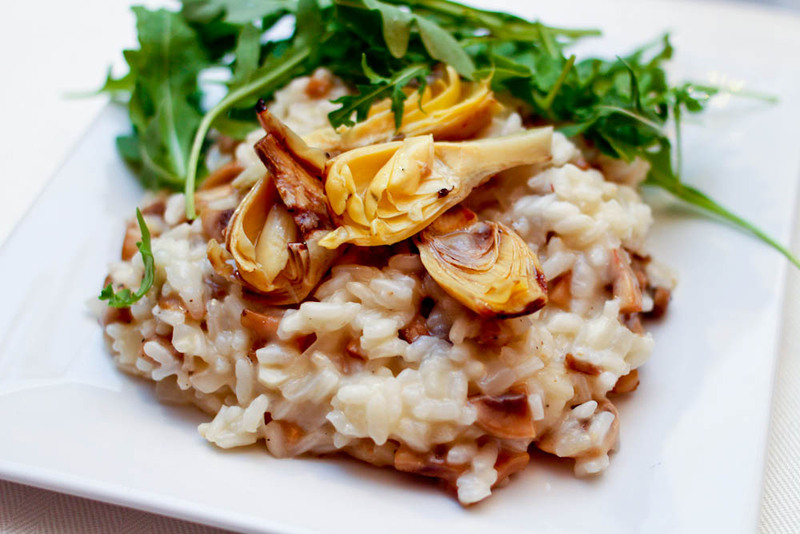 This entry was posted in Dinners in 30 min or less, Rice, grains & pasta and tagged risotto and artichokes, risotto med artiskok, risotto med svampe, risotto opskrift, risotto recipe, risotto with mushrooms. Bookmark the permalink. Tak, Birthe. Ja, risotto burde man spise lidt oftere.